In the last minute, I decided to participate in this Show. I searched all carnivorous plants, but I decided to draw the Venus Fly-Trap Plant ...My Favorite...and I also found her flower too. My Black Cat Behind the Venus Fly-Trap Flower just say " No Flies Around". Added a delicate Glitter around the flower and leaves. I hope you like it too. ;) BRIEF INFORMATION ABOUT THE VENUS FLY-TRAP: The Venus fly-trap (or Venus flytrap, Venus' flytrap, Venus's-flytrap) (Dionaea muscipula) is a plant that grows in the U.S. states of North and South Carolina. It is different from most plants because it does not just get food from the soil, it is also an insectivore (it can eat insects and other flying bugs). When you keep it in your house you should feed it insects. Do not feed it meat, because it is mainly an insectivore not a carnivore (the ability to digest meat). If you feed it meat, more than likely it will kill the plant because it will not be able to digest it correctly. 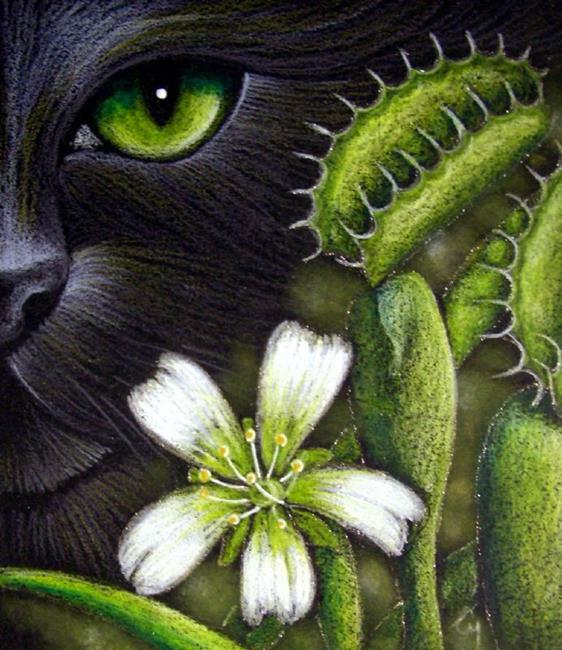 Part of the Venus flytrap smells like a flower to attract insects. When an insect lands there, the flytrap closes its leaves around the insect to trap it. It then uses fluids to turn it into food. Used Artagain/Strathmore 60lbs. paper with Prismacolor Premier Colored Pencils/Watercolor/Soft Pastels/Glitter.